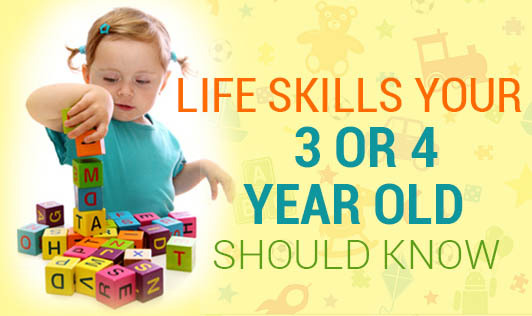 Are you wondering if your kid can do what he should be doing in terms of life skills? The toddler years being the most important period for a child’s emotional development is the right time to lay a strong foundation for building self-esteem and confidence. The way your child feels about his rapid developing abilities and the way he deals with complex emotions have a huge influence on his/her ability to cope with stress in life. One of the important skills is independence. Encourage your child to be independent. Teach him to learn how to wear and remove his shirt or jacket. Encourage him to tuck his handkerchief in his pocket or wear his hat and take it off. Help him keep it in its place without just dropping it on the floor. Help your child pull up or pull down his pants on his own. Help clean up his toys and materials. Put books back into his backpacks. Wear his shirt, pants, and jacket. Set his own table space for snacks. Throw away his own trash after a snack. Have a clear picture of your expectations both in the classroom and at home. Breaking things down for your child step by step and teaching them to understand your expectations is essential.